I was hoping to have more done yesterday but it wasn’t in the cards .. took a bit to finagle the right size (which could be larger, but i’m not changing it now), hunt down my scotch tape (which I’ve still not found – GRRR), cut down the last of the tissue paper to just get the block sections ready – will have to invade the dollar store for more – hunt down my glue stick (which I did find), and move my machine into the kitchen. I wanted the larger table to help support the weight of this quilt. 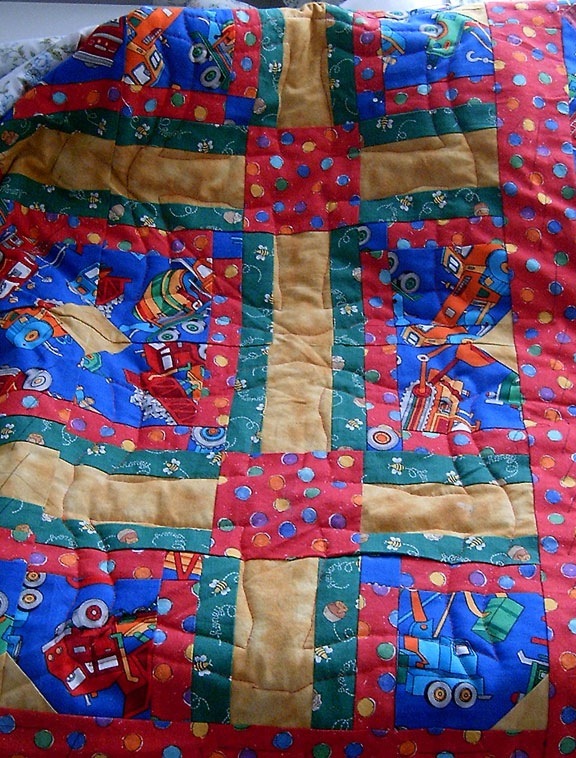 I am sooo wishing I had thought of trying quilt as you go BEFORE I put the borders on this one .. and the borders are rather a Dr. Frankenstein creation on their own .. so that’s not going to happen! And of course relocate Princess Hiss, my Shadow Kitty – such a devote sun and cushy worshiper isn’t she??? I only did 2 for test purposes just in case I had to make some drastic changes instead of minor adjustments. I did meet with a few challenges so far .. first and foremost is the block size .. these are 13½” finished and larger than I like to normally do .. 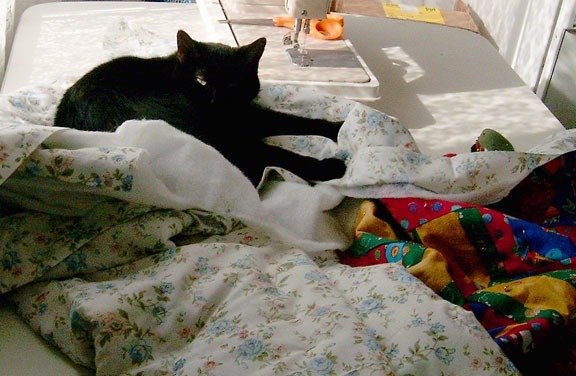 I prefer to do 9 – 10″ for quilting ease mostly. Who would have thought that a double-sized quilt with poly batting would weigh so much (!?!) So there’s adjustments to be made there for the weight and size. Challenges – there were a few; I had the quilt all rolled up nicely and folded, but that proved to bulky to move that way, so I’ll just sort of tent it around the block that I’m working to allow ease of movement. I used a dab of glue stick on the first motif, but that shifted so opted to use pins in the second … that worked nicely 🙂 For some reason my thread snapped in the same spot near the lower left corners – there might be more pull on the quilt than I thought at that spot due to weight – so I’ll be working thru these challenges and whatever else pops up. And I’m sure there’ll be a few more that I’ve not anticipated. I wanted to get more done last nite, but The Biggest Loser came on and I watch that show every week .. I missed it last week and had to catch it at like midnight on Saturday as we don’t get the west coast channels that it repeats on later that nite – So, I worked on my sleeves for my “hoodie or not” instead – I still want to get that done while I can wear it this season! Grace, it’s looking beautiful! I love the bright colors, and the motifs you chose are so perfect! Wow all to read me? ?